While ethanol is typically produced from the starch contained in grains such as corn, sugarcane, and grain sorghum, it can also be produced from cellulose. Cellulosic ethanol is made from non-food products such as corn stalks, wood chips and switchgrass. If this tiny corner of the ethanol industry develops into a large enough producer, cellulosic ethanol could prove to be a viable, lower-cost compromise in the ethanol vs. gasoline debate. Cellulose is the main component of plant cell walls and is the most common organic compound on earth. It is more difficult to break down cellulose to convert it into usable sugars for ethanol production. Yet, making ethanol from cellulose dramatically expands the types and amount of available material for ethanol production. This includes many materials now regarded as wastes requiring disposal, as well as corn stalks (corn stover), rice straw and wood chips or "energy crops" of fast-growing trees and grasses. Producing ethanol from cellulose promises to greatly increase the volume of ethanol fuel that can be produced in the U.S. and abroad. A recent report found that U.S. land resources are capable of producing a sustainable supply of 1.3 billion tons of biomass per year, and that 1 billion tons of biomass would be sufficient to displace 30 percent or more of the country's present petroleum consumption. Cellulosic Ethanol Production also offers tremendous opportunities for new jobs and economic growth outside the traditional "grain belt," with production across the country from locally available resources. Cellulosic Ethanol Production will also result in a reduction of greenhouse gas emissions. The Iogen Corporation in Ottawa, Canada currently produces just over a million gallons annually of cellulosic ethanol from wheat, oat and barley straw in their demonstration facility. Several existing ethanol plants in the U.S. are engaged in research and demonstration projects with the U.S. Department of Energy utilizing the existing fiber in their facility that typically goes into the livestock feed coproduct. Enzyme companies including Genencor International and Novozymes have led successful research projects with the Department to significantly reduce enzyme cost and increase enzyme life and durability. With continued advancements in pretreatment technology, fermentation, and collection and storage logistics, the commercial production of cellulose ethanol becomes more economically feasible. Creates a credit-trading program where 1 gallon of cellulosic biomass ethanol or waste derived ethanol is equal to 2.5 gallons of renewable fuel. Creates a cellulosic biomass program of 250 million gallons in 2013. Creates a Loan Guarantee Program of $250 million per facility. Creates a $650 million Grant Program for cellulosic ethanol. Creates an Advanced Biofuels Technologies Program of $550 million. Targets Biomass Research and Development. Establishes program of production incentives to deliver the first billion gallons of annual cellulosic ethanol production. Production methods: There are two broad ways of producing alcohol from cellulose. Hydrolysis breaks down the cellulose chains into sugar molecules that are then fermented and distilled. Gasification transforms the carbon in the raw material into a gaseous carbon monoxide that is then fed to a special kind of fermenter. Hydrolysis processes The cellulose molecules are composed of long chains of beta-glucose molecules. In the hydrolysis process, these chains are broken down to "free" the sugar, before feeding it to a fermenter for alcohol production. Distillation to produce 99.5% pure alcohol. There are two major hydrolysis processes: a chemical reaction using acids, or an enzymatic reaction. In the traditional methods developed in the 19th century and at the beginning of the 20th century, hydrolysis is performed by attacking the cellulose with an acid under high heat and high pressure. Modern variations of this technique are being explored by companies such as Arkenol or BC International Corporation. Enzymatic Hydrolysis Cellulose chains can be broken into beta-glucose molecules by the cellulase enzyme. This reaction occurs at body temperature in the stomach of ruminants such as cows and sheep, where the enzymes are produced by bacteria-there are actually at least three enzymes, used at various stages of the conversion. 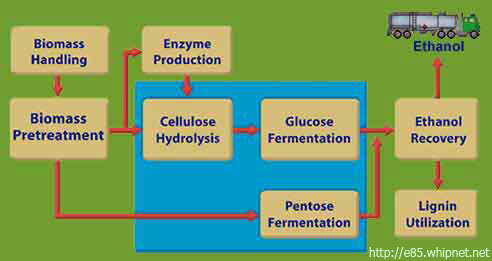 The enzymatic hydrolysis process depends on a steady supply of the cellulase enzymes. The IOGEN corporation is a Canadian producer of enzymes. They are promoting an enzymatic hydrolysis process that uses "specially engineered enzymes". The raw material (wood or straw) has to be pre-treated to make it amenable to hydrolysis. Genencor and Novozymes are two other companies that have received United States government Department of Energy funding for research into reducing the cost of cellulase, a key enzyme in the production of cellulosic ethanol by enzymatic hydrolysis. Other enzyme companies such as Dyadic International, Inc. (AMEX: DIL) have been using fungi to develop and manufacture cellulases in 150,000 liter industrial fermenters since 1994. With the advent of genetic engineering and genomics companies like Dyadic, Genencor and Novozymes have the modern biological tools such as Dyadic's patented C1 Host Technology to develop and manufacture large volumes of new and better performing enzyme mixtures to make the production of cellulosic ethanol more economical. - Ethanol is separated from water An alternative to fermentation is to use a catalytic reactor where the carbon monoxide and water are combined to create ethanol.